South Dakota Public Broadcasting’s coverage of the on September 16, 2006 can be replayed from this page with your broadband connection and using "Real Player". Or you can order a DVD of the Parade and/or the Dedication Ceremony. Order a Video of the Parade and Dedication at http://shop.sdpb.org or call. 1-800-456-0766 or 1-800-777-0789. 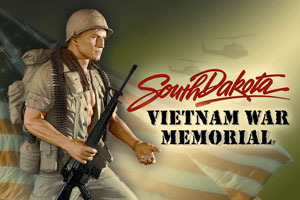 See the SDPB TV production of "Vietnam: Survivor Stories"
The State of South Dakota maintains the official state website for the Memorial Dedication. Coverage of the parade and dedication is made possible by First PREMIER Bank and PREMIER Bankcard.